When news broke at the end of 2014 about President Obama's policy changes in regard to the U.S.-Cuba relationship, it was expected that it would take time to issue the new regulations and establish new opportunities for several sectors of the U.S. business community. However, Luis Alcalde, born in Havana with dual citizenship in America and Cuba, had been anticipating the day of President Obama's policy changes. With organized trips to Cuba prior to 2014, Alcalde maintained a focus on Cuba and continued to provide counsel to clients on Cuba-related activities authorized by U.S. law. 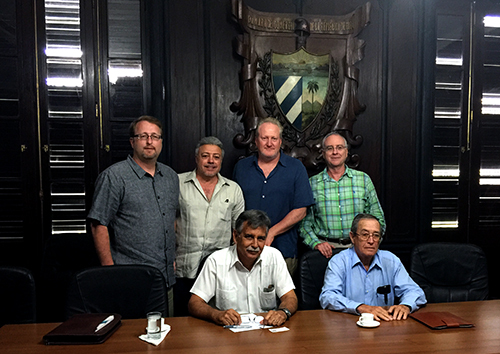 On March 23, Alcalde traveled to Havana with attorneys Ralph Breitfeller and Tim Tullis as part of the firm's continued involvement with Cuba. During their stay, they met with legal experts on a variety of topics, including Cuba's new investment laws and protections for foreign investors. "There are future opportunities in Cuba," said Breitfeller. "Trade will become more open but will take time, which is to be expected." In addition to meeting with legal experts, the attorneys had a chance to explore the city. With the University of Havana, Hemingway's house, the Havana Art Museum and the Fort of San Carlos de la Cabaña on the tour list, the attorneys were able to immerse themselves in Cuban culture and see first-hand the many business opportunities available as trade with Cuba expands. "As we traveled throughout the city, we were welcomed by everyone we met," said Tullis. "The Old City of Havana was rich with history and was worth the time to explore. It is easy to see how Havana can again become a huge tourist destination for Americans, opening up many U.S. export and investment opportunities." Alcalde and other Kegler Brown attorneys are planning additional trips to Cuba this year to continue exploring business opportunities for both U.S. and foreign clients as well as clients already investing in Cuba. Find out more on the firm's focus on Cuba.